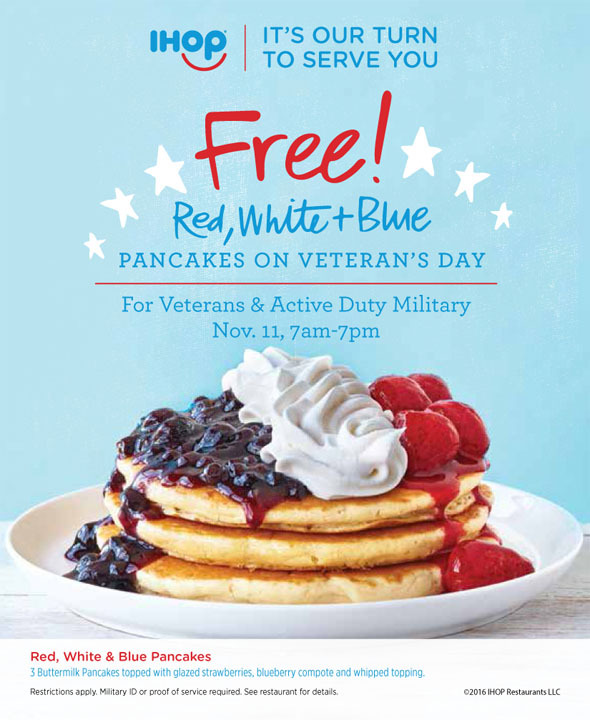 On Friday November 11th, IHOP is offering a free stack of their famous Red, White, & Blue Pancakes to all veterans and active duty military to show their appreciation this Veteran's Day. IHOP's Red, White, & Blue Pancakes feature 3 of their world famous buttermilk pancakes, topped with glazed strawberries, blueberry compote, and whipped cream. These patriotic pancakes will be available from 7 a.m. - 7 p.m. for any veteran or active duty military. Share a moment with your favorite veteran this holiday with IHOP's Red, White, & Blue Pancakes!